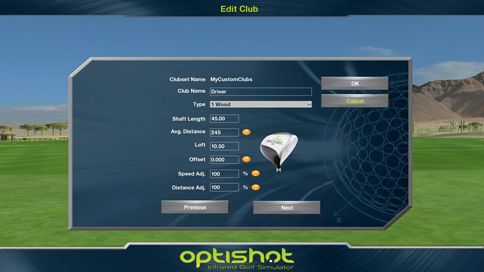 If your OptiShot consistently gets inaccurate swing results you may need to make adjustments to increase accuracy. There are two possible causes for this issue: Lighting in the room and Software settings. Something else to keep in mind is that irons will tend to produce more accurate results compared to woods. We have found that drivers with a smooth and reflective bottom will yield more accurate results with OptiShot than those with an irregular and non reflective bottom. If your lighting is properly set up and your Swing Pad appears to be functioning properly but you are still getting inaccurate results then you may be able to resolve the inaccuracies by customizing the clubs. To do so you need to create a custom Clubset. Select the actual club you are using, take a few swings and observe the results. If the results are not quite what you would expect then you may edit a number of factors that may bring your swing results in line. Open the Edit Club window by clicking the E key on your keyboard. Do not worry about entering your clubs' exact details; just use this area as a tool to get the ball flight to be accurate. For instance, if your club face is always open you could try setting the club's offset to something dramatic like 0.500, take a few swings, and observe the results. The larger the offset, the more the club face will be closed. Continue to make small adjustments and test swings until the ball flies true. Next you might edit the club's speed adjustment up or down from 100% (999% maximum) to bring the club head speeds in line with what you would expect. Then observe the distance the ball is traveling. If that is off, make changes to the Distance Adjustment up or down from 100% (999% maximum) until the distances are correct. You would then do this for each club in the Clubset. Note: Detailed instructions on creating Custom Clubsets may be found in the Users Guide.